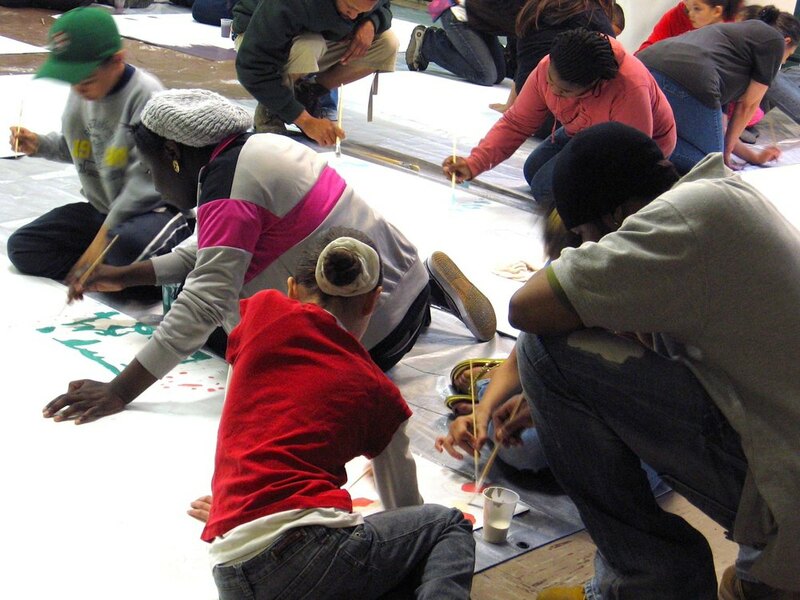 PURPOSE: Coordinate collaborative design, painting, and installation of community mural for garden. After creating the mosaic project, we continued to work with the Hunting Park Community Garden to design a mural for the adjacent wall. We partnered with mural artist Bernie Wilke and surveyed community folk for initial ideas, and then hosted three community meetings where Bernie presented his design for feedback from members of the community. This collaborative design process builds the design on the input of the very people who will wake up each morning, walk out on their porch, and see this work of art. The residents of the block wanted the mural to depict what they were most proud of. The garden existed because of the unity and hard work of the people who lived on that block. In creating the garden, they had taken ownership of their physical space. They chose to portray in the mural the three community leaders responsible for initiating the transformation of a vacant lot into community green space. Pictured: Andy (the community gardener), Jeff ( block captain), and Luis (community leader, and Jeff’s next-door neighbor and best friend). Residents also wanted to show children working the garden because they were proud of how the kids on the block volunteered to help clean up the lot. Residents also wanted to represent the positive impact of this urban garden, not only in Hunting Park, but in the whole city. They believed that if everyone took small steps to cultivate and care for their own block, our entire city would be transformed. Once the design was complete, we reached out to a broader community to establish fruitful partnerships with others seeking similar goals. A local church donated indoor space to host our Community Paint Day. 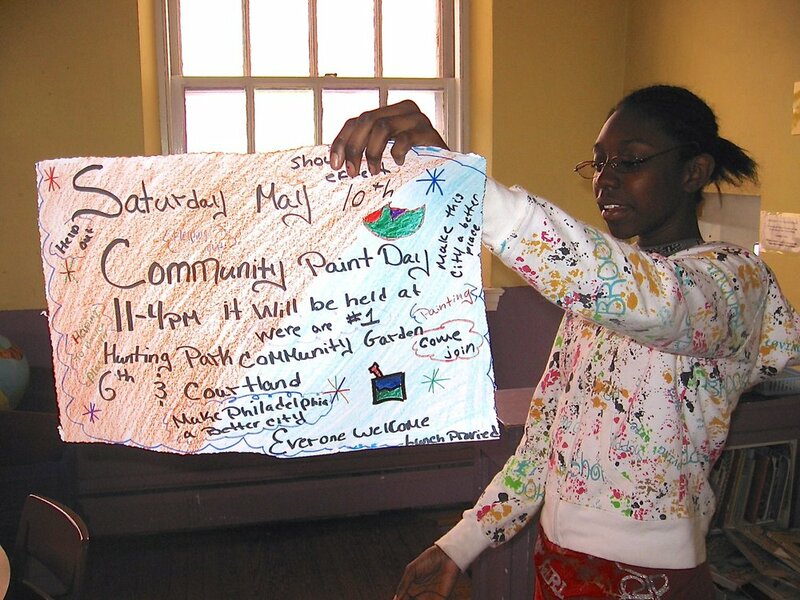 YouthBuild, an alternative high school in Philadelphia, helped facilitate the prep-workshops and the Community Paint Day. 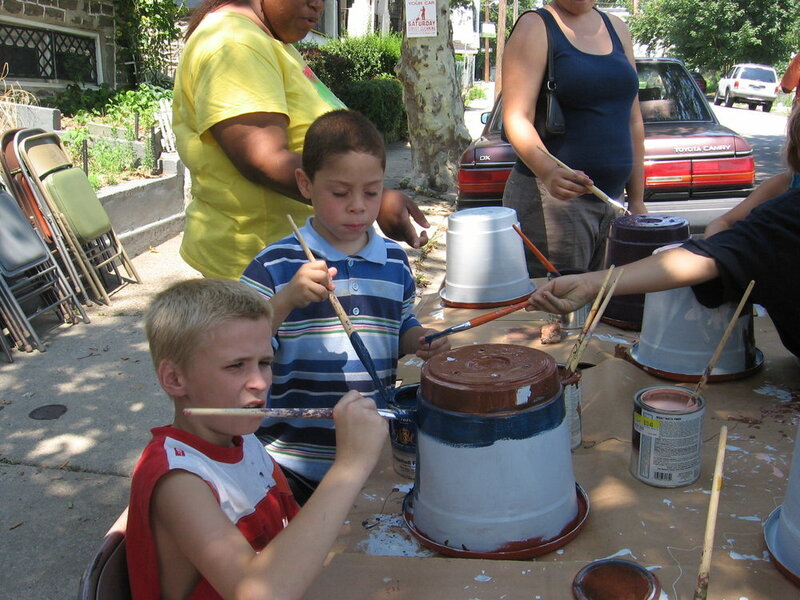 We received a small grant from a foundation that funds art projects related to greening vacant urban spaces. A local contractor donated two days of work to install the mural. Without these partnerships, this mural would have remained simply a good idea. We painted in three steps. First we invited our partners and a small group of committed community members to learn about how to clean and green urban spaces as well as how they would operate as hosts the day we invited the community in to paint. They learned how to use the “paint-by-number” method to enable many participants to paint consecutively. It was exciting to equip the hosts, some as young as age ten, to lead members of their own community and to empower them to work creatively side-by-side. 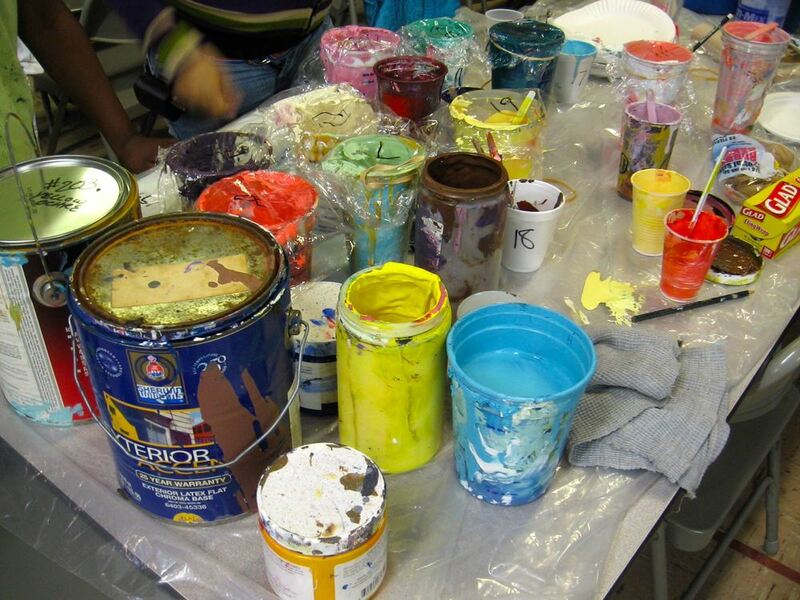 I learned a lot about myself in the “chaos” of our second step: the Community Paint Day. As an administrator and artist, I had concrete ideas of how things should be organized. While it was my role to facilitate, I had to release control of many details of the day in order to accomplish the greater goals—specifically that our trained hosts would take ownership and empower members of the community to contribute to the creative process. Ultimately, there are numerous methods to accomplish these goals. 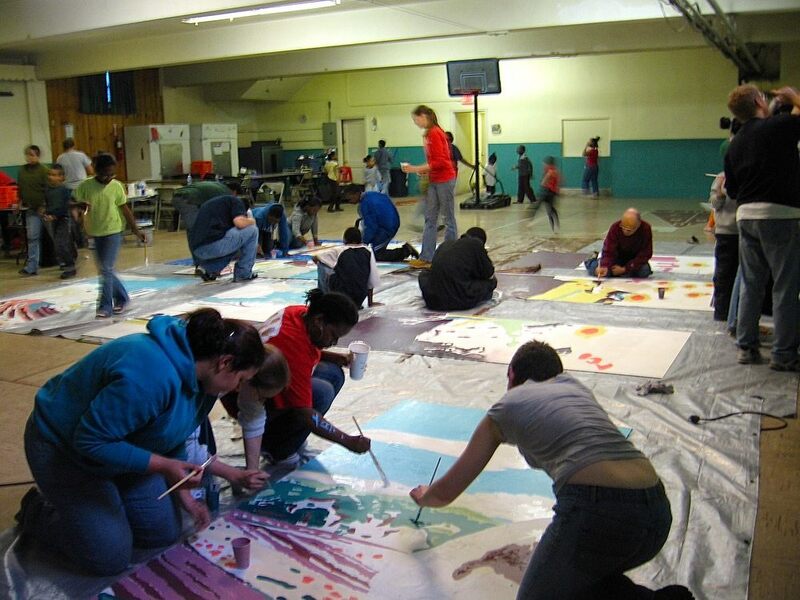 By the end of the Community Paint Day, about 90 percent of the mural board had been painted with a base of color. The third step was to invite in our talented painter friends to fine-tune some of the more detailed sections and finish our mural: Cultivation. Celebration is a key element to any collaborative creative project. My neighbors have taught me its importance. When the mural was installed, we could feel the excitement on the block. We followed up with a block party to dedicate and celebrate, complete with magic show, a planting pot painting project, and lots of food, music and dancing. A block captain who was a spoken word artist performed a poem he had written for the dedication. The local news covered our dedication. All over then neighborhood the next day, people repeated: “Hey, we were on the news last night!” Everyone talked about how proud they were of the project. 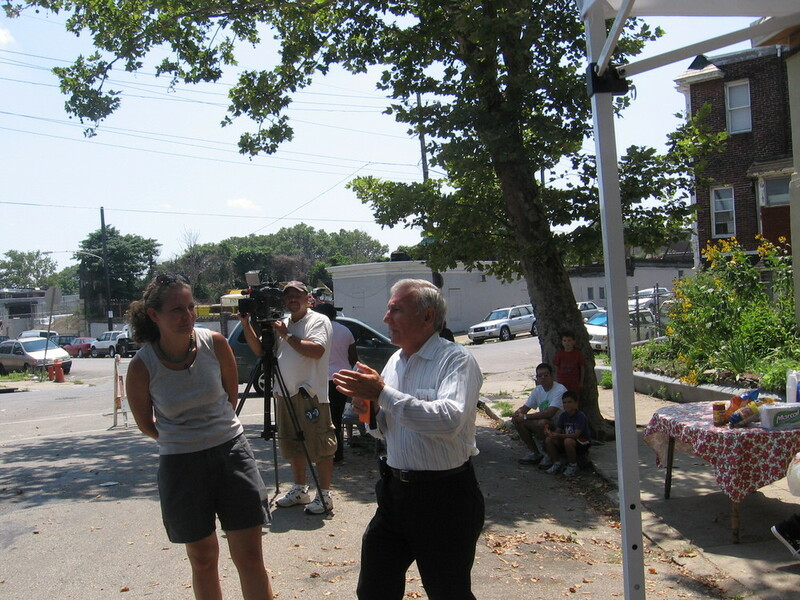 Our neighborhood is often on the nightly news for reports of crime, murders, drug busts, fires, and other stories of the crises that surround poverty. Rarely is our neighborhood covered for something positive. The joy of Cultivation was that over 70 of our neighbors could claim responsibility for that story.